Deep in the woodlands of Konkan, there are areas reigned by a particular creature: the forest floor, the leaves and the tree trunk, are booming with a frenzy of this small, nimble-footed, bright yellow-coloured insect carrying a lethal spray-gun of formic acid. It is called Anoplolepis gracilipes, and is more commonly referred as the Yellow Crazy Ant. 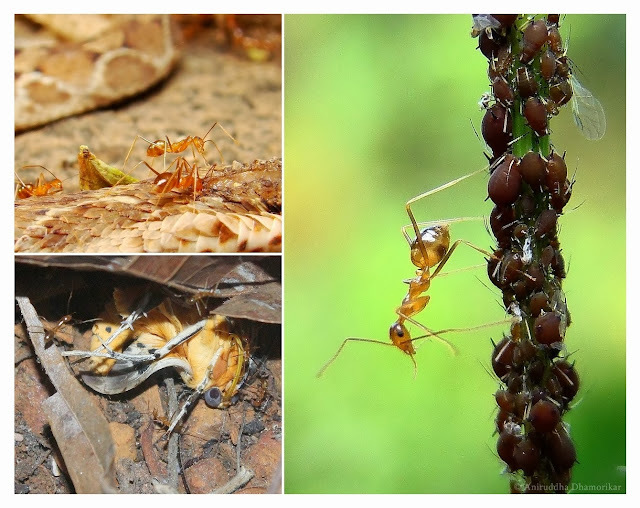 This story is about these ants, on what they mean to be in India’s forests (more specifically northern Western Ghats), and forms a prelude to a larger story which has not been enacted in India yet, but has been and has lead to drastic changes in landscapes in several parts of the world. Taxonomically, the Yellow Crazy Ant (Anoplolepis gracilipes) is an ant in the family Formicidae (subfamily Formicinae, tribe Plagiolepidini). There are over 22 species identified so far under Anoplolepis genus, most of them unheard of outside their native range. A. gracilipes is one of the few ants rather renowned for all the wrong reasons an animal (read: man) is known for: overpopulation and overexploitation, and the resultant self-centered development and destruction. But where mankind fails, this ant succeeds: its rule is completely in the lines of the natural limit of a species. It is one of the several species of ants (about 15 to 20 species according to this article) capable of forming super-colonies, which are much similar to metropolitan cities which encompass several other cities, towns, and villages within their defined boundaries. A super-colony is just that, with millions, in some recorded cases billions, of members, each with a particular role to play, and several queens which keep the colony populated. Ants are probably best studied for their precise division of labour, and this is what we’ve studied so far in text-books: a queen ant (and a drone ant), several workers and soldiers, constitute a colony with defined roles. This monogynous colony is, however, only a minute aspect of the complex social life of ants. In a super-colony pioneered by the founding queen, several daughter queens carrying the same genes as the founder slowly spread over an area. Just as the founder, these queens also lay foundations of their colony, consisting of workers and soldiers and so on, and all these colonies share their labour and ultimately cover a significant area of a landscape to be called a super-colony (also called polygynous colony). Although there is no specific mathematics I’m aware of which labels an ant colony as a super-colony, such colonies are spread over a large area, and the impact of their rule in their landscape is what provides us with the calculable damage in terms of loss of biodiversity. A. gracilipes is a highly adaptive ant, capable of travelling like its fellow humans on ships and airplanes, and quickly get acclimatized under ideal conditions. It is one of the several invasive species that have been transported and “accidentally” introduced into other regions. Some species prove to be detrimental to the local biodiversity, for example, accidental introduction of rats to some of the New Zealand group of islands wrecked havoc on its ground-dwelling fauna, especially seabirds which nest on the ground, leading to macro-level ecological modifications and intricate micro-level changes such as reduction of soil nutrition on such islands and alteration of fungal community structures (Peay et al. 2012). In case of A. gracilipes, it is their subtlety and the prospect of sudden proliferation under ideal conditions for which they have been on the radar of ecologists for quite a few decades. A story worth sharing about A. gracilipes is from Christmas Island in the Indian Ocean. The ant was probably introduced here between 1915 and 1934, however it was never considered as a threat then. In 1990s, a sudden explosion of A. gracilipes colonies was observed, with experts reporting as high as 79 million workers per hectare. This outbreak was linked to the outbreak of scale insects, which are Hemipteran bugs producing “honeydew”, which is actually their poop. The scale insects feed on plant sap, and excrete excess sugars (hence the name honeydew). These super-colonies lead to drastic change in the island’s ecosystem, with keystone species such as a Christmas Island Red Land Crabs being preyed upon by the ants (more on the history and present status of these ants on Christmas Island here). The native distribution of A. gracilipes is still debated, but is centered somewhere around south-east Asia, including India (with scientists suggesting West Africa, India or China (source)). Given India’s climatic and biogeographical diversity, I shall assume that A. gracilipes was either already present in India or was naturally introduced to the subcontinent. With this assumption in mind, what makes it an alien in its own native land is something that bothers me. So far in my explorations in the Sahyadri, I’ve seen these ants in great numbers only at Yeoor Hills and Nagla Block, both a part of the Sanjay Gandhi National Park, and Phansad Wildlife Sanctuary, with a few scattered, or small, colonies in Matheran Eco-sensitive Zone, Karnala Bird Sanctuary, and Tungareshwar Wildlife Sanctuary. Although this number is small, the image of seeing vast stretches of forest-floor riddled by just one particular ant is baffling. At places in Yeoor Hills, Nagla Block and Phansad WLS, they stretch for at least a kilometer in their expanse, with their members streaming in all directions possible. These areas are typically characterized by a startling lack of other invertebrate or reptilian diversity in the area. To understand what makes them so gregarious, there are several points worth noting about A. gracilipes, we’ll look at them one by one. Area specificity: These ants are almost always seen in forested areas. 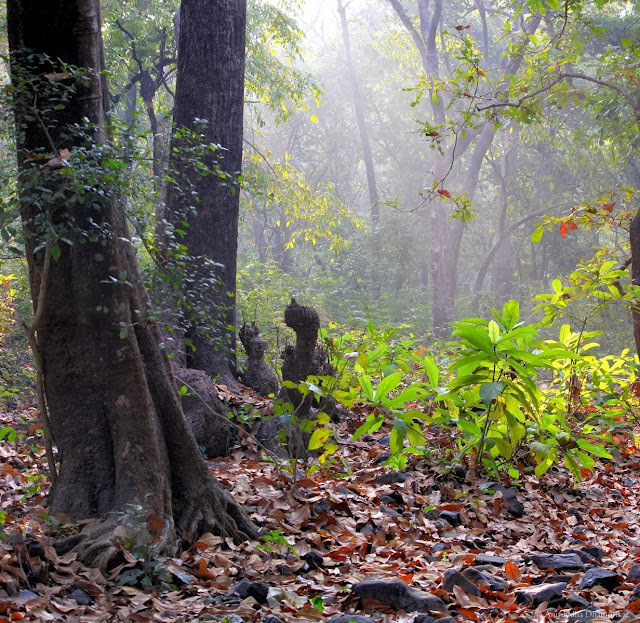 It is worth noting that I have not seen them in urbanized areas nor rural areas but specifically in forested areas, with the exception being Ovala Village on the periphery of SGNP which has a good tree cover. On Christmas Island, these ants were also reported to be around Christmas Island National Park Boundaries. Breeding capacity and nesting preferences: As stated earlier, these ants are prolific breeders and live co-operatively with their sister colonies. Also, they are not choosy about their nesting sites, and have been seen to nest on open ground, in leaf-litter and in tree crevasses. A number of these were observed at Phansad WLS, precisely at Chikhal-gaan, with the ants swarming the entire trunk of the tree which was over 5 meters tall. Broad range of diet: This ant is an excellent scavenger, and has been sighted scavenging on a road-kill of a Saw-scaled Viper (Echis carinatus).They are excellent predators, and have been seen taking down a teneral Arctiid moth. They are excellent opportunists, and have been sighted tending to aphids and scale-insects. 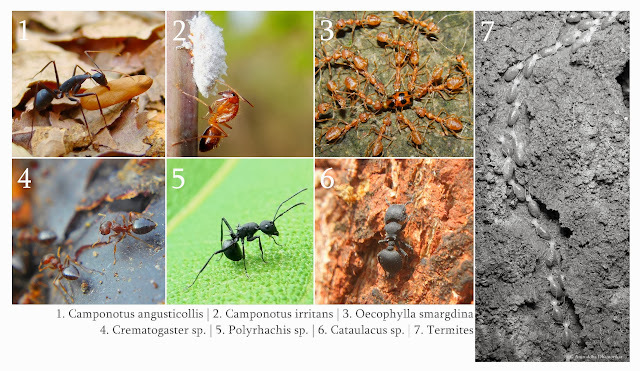 Competitiveness: The presence of these ants is marked by the absence of other common ants of Konkan’s forests: the Weaver Ant (Oceophylla smargdina), Polyrhachis sp., Camponotus angusticollis, Camponotus compressus, Camponotus irritans, and Cataulacus sp, as well we termites. The only ant tolerant to A. gracilipes is Crematogaster sp. or to an extent Camponotus sps., and are seen in the same area where A. gracilipes pervade. It is worth nothing that all except Camponotus sps. are especially known to nest on trees. Since A. gracilipes is mostly found nesting or scavenging on the ground, it can be assumed that its impact on canopy diversity is lesser than that on the ground, however places such as Phansad WLS, as mentioned before, may tell a different story. and 3, 4, 5, and 6 preferring to nest on trees. A. gracilipes do not bite or sting, but squirt formic acid in defense, which causes irritation on contact with skin. I have not seen A. gracilipes engaged in a battle with the above mentioned ants, or termites, but they do compete indirectly in terms of food resources, given their broad range of diet. This therefore also affects the local biodiversity by preying upon it. Perhaps most important reason which makes this ant a winner of the forest-floor is their genetic makeup: Perhaps God, if he exists, has finally created a master species to precede mankind in terms of overpopulation. Experts say that mutation can lead to the collapse of their empire, with this article sighting a scenario where a queen ant, because of mutation, begins to lay eggs which give birth only to queens. If this is the case, the colony will soon start collapsing upon itself as these queens would also give birth to queens. There are several other ants worth mentioning which are highly invasive, such as the Argentine Ant (Linepithema humile), which has been recorded as world’s largest super-colony covering an area of 6000 sq. km. in Europe alone. What’s special about A. gracilipes is its potential invasiveness in its native range (if India is its native range). I find that A. gracilipes also represents an indicator species paradox, which is quite similar to invasion paradox. In invasion paradox, as questioned by Fridley et al: are rich native communities more or less susceptible to invasion by exotic species? The authors noted that “…natively rich ecosystems are likely to be hotspots for exotic species, but that reduction of local species richness can further accelerate the invasion of these and other vulnerable habitats”. As seen in the Christmas Island story, this ant is capable of forming super-colonies in presence of a preferred food source, which indicates that there is an abundance of a certain species, in this case the scale insect, or it indicates that there is an abundance of other species which the ants can easily prey upon given their broad range of diet. This means that presence of A. gracilipes is either the indicator of a disturbed, or a diverse ecosystem, but this diversity is what brought the ant to prey upon it and made it strong enough to establish a super-colony, thereby depleting this diversity. This paradox differs from the invasion paradox since it is only applicable in an organism’s native range. This begs for another question: why aren’t other ants, such as the Weaver Ant, Carpenter Ant, and the Crematogaster, as invasive as the Yellow Crazy Ant? Part of the answer lies in the monogynous-type of colonies these ants create. As soon as a queen is born, she flies off, finds a drone most probably of another genetically-different colony, and establishes her own independent colony. Ants of other colony do not tolerate queens of the same or different colony to establish the nest near their empire, and kill the queen. In addition, their birth rate and food preference also play a major force on their colony size. Study their density in the area. Map area of their spread. Collect some for genetic analysis (this might require permission and might cost a bit). Assess biodiversity of the area and determine species diversity and density in areas in presence and absence of A. gracilipes (for invertebrates, vertebrates, as well as flora). Identify this ant’s food preferences. Observe this ant’s interaction with other ants (arboreal as well as ground-dwelling). Replicate same study for other areas containing super-colonies, and compare this along with their genetic makeup with a similar study at other geographically distant area. Areas I have identified are SGNP (especially Yeoor Hills and Nagla Block, as observed in 2012) and Phansad WLS, as observed in 2013, which are both quite distant from each other but share similar climatic and geographic features. Initiate a citizen science project where naturalists from all corners of India can submit their records of A. gracilipes colonies. Please note that the objective of this story or the proposed study is not to belittle our little crazy ant, but to understand, and be amazed by, the role of these underappreciated group of organisms in the functioning of an ecosystem at micro and macro-level.